Dwane Casey's pregame announcement that Blake Griffin 's knee was "too sore" for him to play in Game 1 of the team's first-round NBA playoff series against the Milwaukee Bucks foreshadowed the debacle that was about to occur Sunday. Pistons forward Thon Maker -- a fan favorite when he played for the Bucks -- was booed every time he touched the ball. Nathaniel S. Butler/NBAE via Getty Images Griffin -- dressed in a maroon suit -- sat with his hands folded in his lap, watching his team take a lashing on the court in front of him. 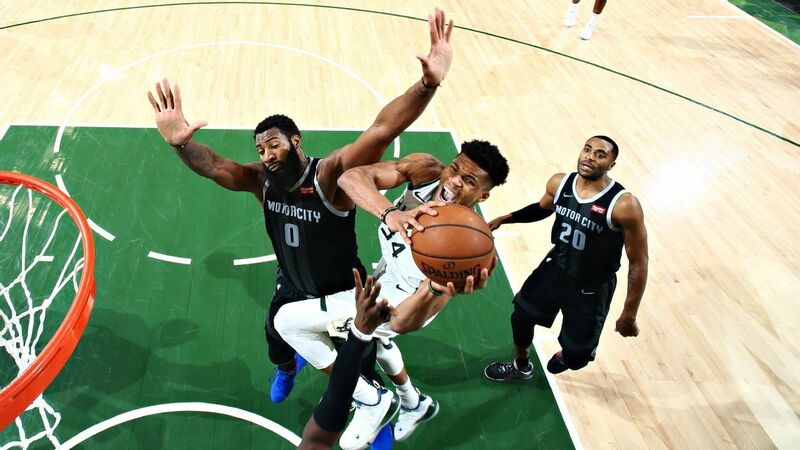 Antetokounmpo had a jaw-dropping dunk from near the free throw line, but minutes late Drummond made sure there wouldn't be a repeat performance. Casey said he thought the foul should've been a flagrant 1 -- which applies to unnecessary contact that isn't deemed excessive -- but said he understood that the officials were trying to control the game and set a tone.